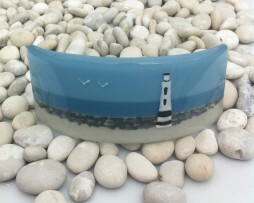 The Lighthouse curve – 6 by 18 cm. 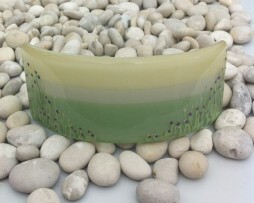 A simple but effective way of using glass, these hand painted curves are fired and then slumped over a curved mould to create a free standing piece to place anywhere in the home. 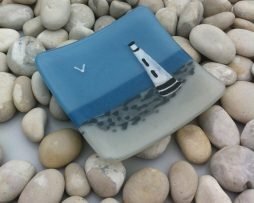 The Lighthouse 8 by 8 cm dish. 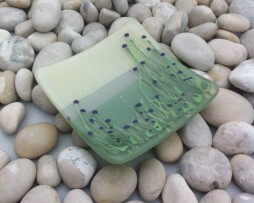 Beautifully hand painted glass, fired and slumped into a simple dish. Thistle Field curve – 6 by 18 cm. A simple but effective way of using glass, these hand painted curves are fired and then slumped over a curved mould to create a free standing piece to place anywhere in the home. 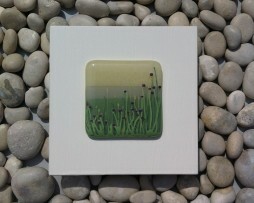 Thistle Field is a 12 x 12cm wall panel. 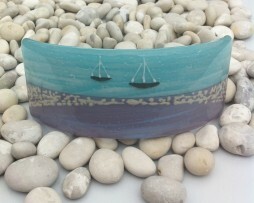 Layers of hand painted glass, fired and fixed onto a satin painted wooden mount. These wall panels also have a ‘key slot’ fixing to fit flush against the wall. Tranquility curve 6 by 18 cm. A simple but effective way of using glass, these hand painted curves are fired and then slumped over a curved mould to create a free standing piece to place anywhere in the home.